Mayor Rahm Emanuel and Navy Pier, Inc. President and CEO Marilynn Gardner announced that, for the first time ever, a hotel will be built on Navy Pier. The new hotel is part of Navy Pier’s Centennial Vision, its plan for the redevelopment and reimagination of the 100-year-old Pier. The project will begin construction in 2017 and is expected to create 300 construction jobs and 200 permanent jobs. 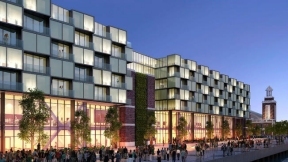 Comprised of five floors of rooms overlooking Navy Pier’s South Dock, the new hotel will be located on the east end of the Pier next to Festival Hall. The hotel will have more than 200 guest rooms, which will be built above the south-facing Festival Hall terraces, providing guests with spectacular views of the city, Lake Michigan and the Pier. For the first time in the history of Chicago’s great landmark, Navy Pier will offer guests an opportunity to spend the night on the Pier – a convenient option for both local residents and out-of-town guests attending events on site, in the city on business, or just looking to spend extended leisure time at one of the Midwest’s most popular locations. Renowned architect Jackie Koo, of KOO, whose portfolio includes the Wit hotel and other commercial and residential properties, has developed the preliminary design for the hotel. 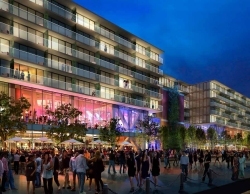 The project, which will be developed and operated by First Hospitality Group, is projected to cost approximately $90 million and will not require taxpayer funds. Construction is anticipated to begin in 2017, with the opening slated for the second half of 2018. The hotel brand will be determined at a later date. First Hospitality Group, which specializes in management, acquisition and development of hotel operations throughout Chicagoland and surrounding Midwest areas, will be responsible for the development and management of the hotel.